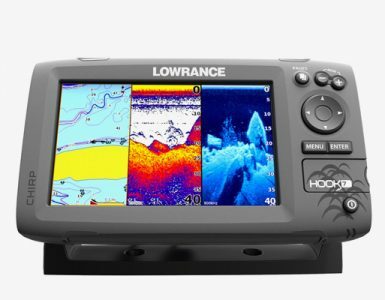 The Elite 5 fish finder from Lowrance is a high-quality product made by professionals for professionals. 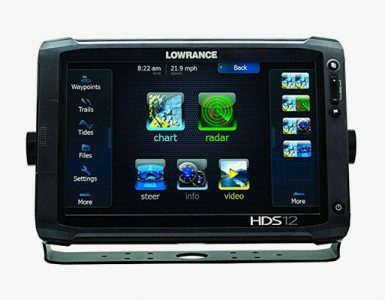 The GPS precision and the easy to use modes are one of the reasons this model is one of the best in its class amongst Lowrance products. A high-quality 5 in. 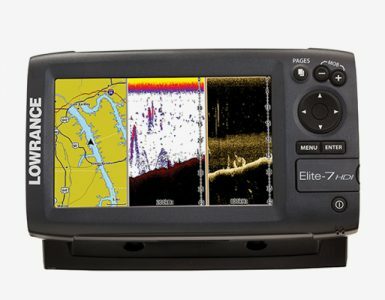 /12.7 cm color display is a must for every modern fish finder device, especially one in this price range. With lots of advanced features, it is able to satisfy even the most experienced of fishermen and the 3.5-pound weight grants a feeling of secure and firm stability to it. Big color display 5 in. The Lowrance Elite 5 model is a great product for someone who knows what to expect from this kind of device. The sturdy built case and immersive interface make it easy to buy it, but the price may drive away some potential customers. On the other hand, it is a professional product that requires someone with a bit more experience in order to get the most out of its advanced features. Not suited for everyone, but definitely worth the money you pay for it. It comes with an integrated GPS antenna and an 83/200+455/800 Transducer. The device is also equipped with detailed U.S. mapping. Of course, fish finders are not rare these days. There are various brands doing a great job of delivering top-shelf products. The “Signstek FF-003 Wireless Portable Handheld Fish Finder FishFinder with Round Sonar Sensor (Transducer) White LED Backlight” model is, for example, a great device that can get you into using these devices if you haven’t been too familiar with them. Other models like the “Garmin Echo 551dv Worldwide with Transducer” are more advanced, but may be too complicated for a beginner in terms of features. So, what to choose? The advanced models or the more affordable ones? We’ve shown you how the “Lowrance Elite 5” stands against the Signstek beginner-friendly model and the Garmin model that is in a similar category as the reviewed device. It is clear that you cannot have all the features and benefits of all three of them, and that’s why it is important to take a look at each one of them and compare their pros and cons. The Signstek FF-003 comes with a receiver/display and a transducer, a sonar sensor that is placed in a ball-shaped object that floats. The sensor reads the conditions under the boat from 2.0 to 120ft in 1/10th precision. The grayscale display has 4 levels and comes with a white LED backlight. If you are thinking that it’s high time you start fishing with the help of a fishing finder, then this is the device for you. It is a highly effective device for beginners and a good guide for experienced fishers who need help to get even better results. Its simplicity is what makes it so great. Also, keep in mind that this device offers a lot for a low price in comparison to other complicated fish finders. The transducer is charged with a USB cable that comes with a package and the receiver can last up to 4 hours of constant use, but you will need to bring extra batteries to avoid ruining your fishing trip. On the other hand, the “Garmin Echo 551dv” model is a more advanced device aiming at being a competitor in the field of fishermen professionals. This device is easily portable due to its light design. All you need to do is to attach it to your vessel or hold it in your hand and the rest is the sonar’s job. The newest addition to this model is its longer battery duration – up to 5 hours which we all love. With the one year warranty, 30 days free return and money back guarantee and 24 customer service response, Garmin 551dv is a great catch. But it falls short when trying to use it in a more professional environment. Sure, the Garmin brand stands for high-quality products, but that doesn’t mean its products all speak to professionals. This device is great in introducing professional fishing equipment to a wider audience, but after that, it cannot compete with more advanced models. Here is where the “Lowrance Elite 5” model shines the most. It has a wonderful ability to be able to appeal to beginners as well as to the professionals. The intuitive modes of this fish finder enable amateurs or first-time users to get comfortable with it, without being too demanding. It is a lovely learning curve that will take an enthusiast and turn him into a professional in no time. After that, it is able to accommodate the needs of the ones hoping for something more advanced. The modes are simply set from beginners to more advanced fishermen, without the hassle of getting a whole new product. Unlike the Garmin fish finder mentioned in this review, the “Elite 5” model does not stay at the same level. It is able to develop alongside the user as he or she progresses. This feature is extremely valuable and a great motivation for anyone to choose this fish finder. Naturally, the other mentioned fish finders are great devices, but there is always a better choice and we hope we helped you make yours. The above review is for the standard Lowrance Elite 5. Below briefly explains other options with the Elite 5 fish finder. What is the difference between Elite DSI, Gold, 5x, 5m? Lowrance Elite 5 DSI: DSI stands for DownScan Imaging. Popular in the Lowrance HDS units, the Elite 5 DSI utilize the DownScan Imaging feature which allows fisherman to get a picture like image below. Compare your sonar readings with the DownScan image to learn more about the structure below. Don’t be surprised when you see fish in the imaging either! Lowrance Elite 5 DSI Gold: This fish finder includes DownScan Imaging, but it also includes a special-issue Navionics Gold chartcard covering coastal U.S. and Canada plus major Canadian lakes and Great Lakes. Lowrance Elite 5 Gold: This is the same fish finder as the original review above, but includes the Navionics Gold chartcard. Lowrance Elite 5x: The Elite 5x fish finder is the same as the Elite 5, however it does not come with GPS/Chartplotting capability. If you are interested in the Elite 5, but only for it’s sonar, this fish finder is for you. Lowrance Elite 5x DSI: The same as the 5x, but it also comes with DownScan Imaging. 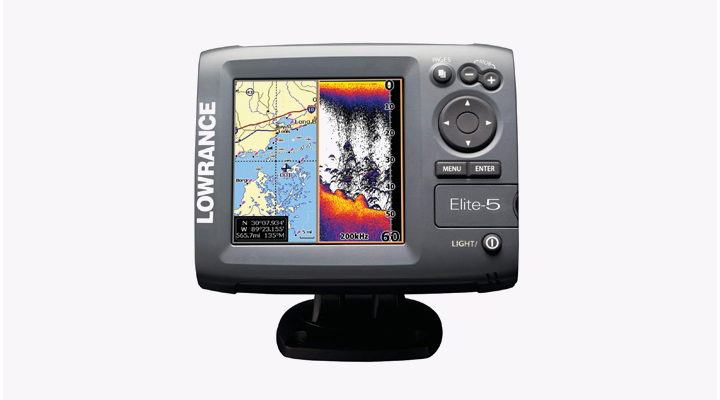 Lowrance Elite 5m: The Elite 5m is a GPS/chartplotter. It does not come with sonar. Lowrance Elite 5m Gold: Same as Elite 5m, but includes the Navionics Gold chartcard. Lowrance Elite 5 Ice Machine: The Elite 5 IceMachine is a portable fish finder / Chartplotter that comes with a ice fishing transducer, but has the ability to be used in the boat with a skimmer type transducer. Ice fisherman who do not like traditional flashers may be very interested in buying this fish finder.